Today, CompStak was featured along with our friends at View The Space and 42Floors in a National article in the WSJ on commercial real estate tech! The article is below, and available on The Wall Street Journal website. The office-space-leasing business has been slow to adopt new technology, but it is now getting shaken up by Internet start-ups. New companies are offering online deal information and videos, and are putting tenants and landlords together without brokers on smaller deals. They say the brokerage business is long overdue for innovation. "It's like trying to book a plane ticket in 1997," said Jason Freedman, co-founder of 42 Floors, a San Francisco-based start-up that has created a virtual office-leasing marketplace online, similar to listing sites for rental apartments. The new companies—all run by executives in their late 20s and early 30s—are targeting different parts of the leasing process. View The Space allows landlords to post videos of their spaces online. CompStak is creating a database of confidential details of leasing deals through crowd sourcing, in which brokers and other real-estate professionals gain access to the database in exchange for anonymous information. CoStar charges brokerage firms monthly fees for its data services, and some customers have griped about the price. Ian Corydon, an analyst at B. Riley & Co., said CoStar's dominance has created enough dissatisfaction to allow young companies to expand. "If you look at CoStar specifically, they are really the only true national solution. There's a lot of desire on the part of CoStar's customers to have an alternative," Mr. Corydon said. 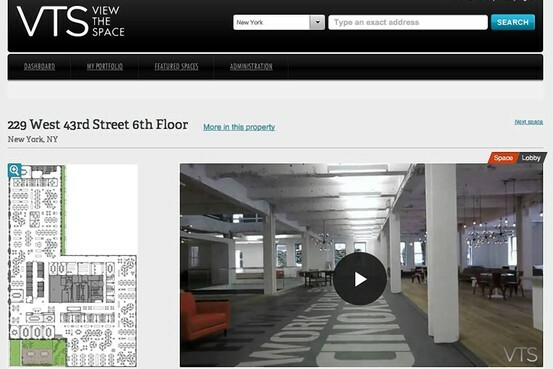 ViewTheSpace Screenshot of View The Space Web page showing Manhattan floor plan. The start-up that poses the greatest possible disruption to CoStar is CompStak, which is looking to cash in on an open secret in the industry: Brokers swap confidential information about leasing deals, including rents and how much the landlord is putting toward tenant improvements. The firm, started by Michael Mandel, a 29-year-old former Grubb & Ellis broker, and Vadim Belobrovka, a 34-year-old software engineer, so far has in its database about 10,000 such "comps," which include more detailed lease information than CoStar offers. CoStar itself also is flexing its muscles further with its acquisition of rival LoopNet, a deal that closed earlier this year. Until now, CoStar's main customers have been brokerage companies. But the LoopNet deal has expanded CoStar's services to providing listings and other information to tenants as well. Before the technology boom, real-estate-brokerage firms had an effective lock on critical real-estate information. But over the past two decades, that monopoly was eroded by the growth companies like CoStar and LoopNet. Many commercial brokerages, meanwhile, were slow to use technology for doing business. Many still make presentations to tenants by sending brochures through the mail. Brokers say they aren't worried about being displaced by technology. They point out that they provide a range of services to office tenants that go beyond such basic things as showing them space and telling them the rent. "Knowing the rent is the beginning of wisdom," said Mary Ann Tighe, chief executive of the New York region for CBRE. "It's not the deal, not even close." Indeed, many of the real-estate-technology companies are taking pains to stay on the good side of real-estate brokers. For example, brokers are able to use View The Space free of charge to either list spaces they are trying to lease or provide tenants they represent with virtual tours. View The Space makes its money from landlords listing spaces. Nonetheless, the new companies face challenges in securing venture-capital funding and creating sustainable business models. A number of technology companies sought to transform the real-estate industry in the early 2000s, only to go belly up when the tech bubble burst. But the entrepreneurial spirit is back. Mr. Freedman, who is best known in the tech world for co-founding FlightCaster, a Web travel service, got the idea for 42 Floors after multiple frustrating office-space searches. Nick Romito, a former professional surfer-turned-broker who co-founded View The Space, was spending three hours a day on the subway in New York commuting to show office space. He began contemplating how to streamline the process. "As a broker, the majority of your day is spent running around like a chicken with your head cut off," Mr. Romito, 29, said. View The Space landed its first client in May 2011, when SL Green Realty Corp.,SLG +1.15% the largest office landlord in New York City, listed several spaces on the site. "Thousands of people toured that space within a couple of hours. We got a call from SL Green saying, 'Our phones are ringing off the hook,'" Mr. Romito recounts. "We couldn't eat lunch. We were freaking out." Steven Durels, director of leasing for SL Green, said the company lists dozens of spaces on View The Space with videos and feels it has helped streamline the process. "We all struggle to find the next big thing and View The Space was one step in that direction," Mr. Durels said.